Muhammad Ali, Robert Kennedy, Andy Warhol, Martin Luther King Jr., Samuel Beckett, Ray Charles, Jackie Kennedy Onassis, Barbra Streisand, James Baldwin, and Truman Capote. 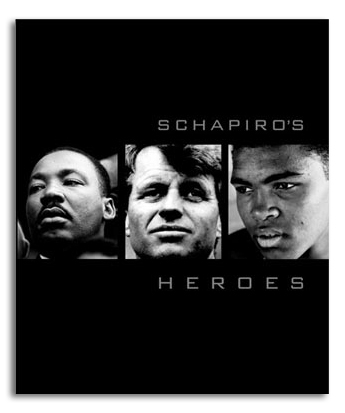 Schapiro’s Heroes brings together an extraordinary collection of stories in the photo-journalistic tradition of people who have shaped our lives, our politics, and our tastes by the celebrated documentarian Steve Schapiro. In behind-the-scenes photographs, we visit the young Muhammad Ali and his Monopoly set, followed everywhere by the neighborhood kids; glimpse the warm family life and campaign of Robert Kennedy, who was so suddenly struck down; see Andy Warhol in photographs never before published; watch Ray Charles perform; visit the set with Samuel Beckett; and march alongside Martin Luther King Jr.
One of the most respected American documentary photographers, Steve Schapiro has a knack for being in the right place at the right time. His heroes are the iconic men and women who have influenced the political and cultural climate of our times. Schapiro’s Heroes is a rare and intimate glimpse of a major period of American history, photographed during the golden age of photojournalism by one of the major talents of the late twentieth century.